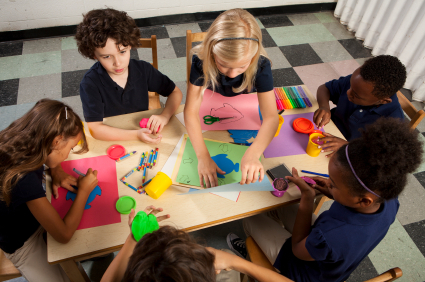 Activities, particularly those involving art, are great ways to teach ESL to a 1st grade student. Looks for or create your own art activities to supplement lessons in science, reading, and social studies. These art activitities can support a lesson about fish, the ocean, habitats, or alphabet letters. The children tear up small pieces of the crepe or tissue paper and glue them to the paper plate. Have them glue on things that look like they belong in the sea (coral, sea shells, plants, etc). Next, they will glue on the fish pictures or crackers. When finished and dry, cover the entire plate with plastic wrap. Punch a hole at the top and tie a length of yarn to hang. This project reinforces lessons of space or alphabet letters. Have the students draw stars on the white paper, making them well defined (tell them to push down a little on the crayon). "Wash" the entire paper with the tempura paint and the stars magically appear in the night sky. You may have to add more water if the paint is too thick. This activity can go along with science, social studies, or alphabet lessons. Flatten the coffee filter and place on a plate or scrap paper. Scribble a picture of the earth with blue and green markers (guide them to do continents, not just scribble all over). It shouldn't be solid as the colors will run when wet. Spray the coffee filter one or two times and wait to see how the colors blend. You may need to help with the spraying, so it doesn't get overly wet. After a few minutes, you may spray again, if needed. After it is dry, you can redo if more color is needed. Paint a night sky on black construction paper. A brush or toothbrush may be used. When dry, glue the Earth on it. If you are adventurous, let them splatter paint: Dip a toothbrush in white paint and tap to get off the excess. Hold it over the paper and lightly rub the edge of a Popsicle stick on the bristles to splatter the paper. Another method is to hold a regular paint brush close to the paper and flick it with your finger. This activity can be used with a lesson on Chinese New Year, a fairy tale reading lesson, social studies lessons, or alphabet activities. Cut construction paper to fit around cardboard roll and glue into place. Cut thin strips of tissue paper (fire colors) and glue inside the roll on one end. (Since tissue paper can be hard to cut, you may want to cut some ahead of time. You can cut several layers at one time with a paper cutter). After they are thoroughly dry, push the ends of the tissue paper inside the roll. Put the other end to your mouth and blow hard and you will see dragon breath. Have the students decorate the tube in Chinese dragon colors. "ESL Activities - 1st Grade." YourDictionary, n.d. Web. 22 April 2019. <https://esl.yourdictionary.com/lesson-plans/esl-activities-1st-grade.html>.